Metabosyn – can it really lead to a happier, thinner you? Metabosyn is a weight loss supplement produced in Salt Lake City by NutriPharm, LLC. Worldwide shipping is offered, and the majority of product marketing appears to be done via the official product website, but it is also possible to buy Metabosyn from Amazon.com. 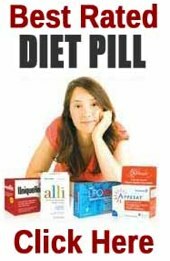 The website style is strikingly familiar as indeed a majority of diet pill brands that hail from Salt Lake City appear to do. 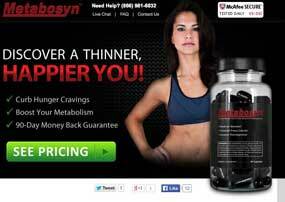 Can Metabosyn offer a happier, healthier you with no fake promises and no hype? Will this one succeed where the other blends have failed? 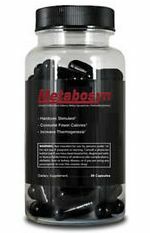 It seems unlikely, and with a price tag of £40.00 / $69.95 plus shipping, Metabosyn is one of the more expensive products on the market. Claims: To reduce cravings, increase your metabolism and also give you a 90 day money back guarantee. The product is designed for use by anyone who needs to lose some weight, and the manufacturers claim it achieves this by curbing hunger, increasing energy, and boosting the metabolism. NutriPharm are also keen to point out that they offer a 90 day money back guarantee, and use this fact as one of the main selling points for the product. It’s always nice to see a company put their money where their mouth is, but potential customers need to be aware NutriPharm also produce several other weight loss products, none of which has set the dieting world alight. Metabosyn is a combined appetite suppressant and fat burner. The recommended dose is one capsule, taken with breakfast, followed by a second capsule, taken at lunch time. NutriPharm claim the capsules have been designed to deliver effective weight loss “without doing anything else”, but state that more dramatic results can be achieved if the capsules are used alongside a healthy diet and an exercise routine. The formulation contains an unusually long list of ingredients and NutriPharm make each and every one of them appear to be a worthy addition, but the official website fails to provide any information to back up their claims, and the absence of inclusion rates makes it impossible to predict how effective their chosen blend may be. As far as fat burning potential goes, raspberry ketone and Bioperine are probably the most promising items in the list, and green coffee bean extract may also have the potential to provide some favorable results. The other items could probably have been dispensed with in favor of higher doses of the aforementioned ingredients, but as no inclusion rates are available anyway, any further speculation is useless. 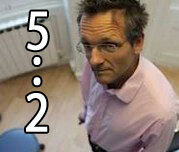 The official website contains two testimonials that are attributed to satisfied customers. If the manufacturers are aware of any side effects related to the use of their product they fail to share this information on their site, but several of the ingredients are known to be problematic. Humulus Lupulus: May cause drowsiness, have a negative reaction with some medications, and should be avoided by anyone who suffers with depression. Evodiamine: Can slow blood clotting and interfere with some medications. It also contains chemicals that are used on animals, to shrink the uterus, thereby reducing the size of their litter. Methyl Synephrine: Can cause adverse cardio-vascular reactions. The blend also contains caffeine (caffeine anhydrous, green coffee bean extract), which may cause problems for some users. It is also worth noting that some evidence suggests evodiamine may help to purge the body of caffeine, so its inclusion in a blend that relies on caffeine for some of its power makes evodiamine’s value more questionable, but no less worrying. It goes without saying, the evodiamine content makes this blend unsuitable for use by pregnant or nursing mothers, and all other potential users are urged to seek medical advice before use. Metabosyn appears to be just another weight loss supplement marketed with high levels of hype and low levels of information. It is an overpriced product, the manufacturers chosen blend contains far more ingredients than are probably necessary, and the lack of inclusion rates makes any potential benefits impossible to predict. The manufacturers fail to supply any supporting evidence to back up any of their claims for the ingredients, and the product itself has never been tested and may not work. It may have the potential to cause harm though, and this is the most worrying thing of all, so the consumer is advised to stay well clear of Metabosyn and consider a safer—proven—alternative instead. Can be ordered direct from its own official website as well as some other third parties such as Amazon. One of the main ingredients in Metabosys is raspberry ketone – as mentioned above there is not enough of the ingredient (as it also contains 14 other ingredients) to provide any benefit. 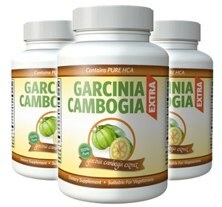 Garcinia Extra contains garcinia cambogia and raspberry ketone in their recommended daily doses and is our preferred product.